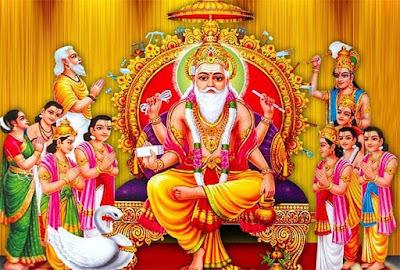 Happy Vishwakarma Puja Date 2019: Vishvakarma pooja is an Indian Festival which is also known as Vishvakarma day or Vishvakarma jayanti, the puja is celebrated for God Vishvakarma who is known as divine architect and the creator of the world, he was the one who constructed the city of Dwarka where Lord Krishna rule. He also created the Mayan Sabha of the Pandavas and also many of the amazing instruments for the Gods, in Rigveda he is also described as the divine carpenter who created the science of architect and construction. When and where it is celebrated? Vishvakarma Puja is generally celebrated in the month of September or October in the states of Uttar Pradesh, Bihar, Jharkhand, West Bengal, Assam, and Karnataka. The festival is also mostly celebrated in industries and companies mostly on the shop floor. As a mark of reverence the day of worship is marked not only by the engineering architectural community but by artisans, craftsmen, welders, industrial workers, factory workers and others. They all gather together to pray for their better future, better development, safier conditions in the future. All the workers also pray for the smooth and fine working of their machines and tools, and it is necessary for craftsmen, carpenters to worship their tools on the day of Puja. Various beautiful attractive posters, statues of Vishvakarma are installed at each and every workplace. Also the pictures of Lord Brahma is also installed and he is also worshiped because Lord Vishvakarma constructed the Universe as per the directions of Lord Brahma. Hindu’s also described Lord Vishvakarma as ‘Devashilpi’, his family consist of mother, sister and father. His mother was called ‘Yogasiddha’, while his sister was called ‘Brihaspati’ and his father was called ‘Prabhas’. In mythological times it is also believed that Lord Vishvakarma not only built this Universe but also created Earth and Heaven. He also created lots of weapons for Gods. He created the famous weapon called ‘Vajra’ which is used by Lord Indra,that’s why he is regarded as the best worker and symbol of quality. Besides the city of Dwarka he also contructed lots of cities like ‘Hastinapur’, the city of pandavas and kauravas ‘Indraprastha’, and most important ‘Sone ki Lanka’ where the demon king Ravana lived and ruled for years. Lord Vishvakarma structure is described as he was having four hands, he used to carry water pot, a book, noose and his tools with him. Vishwakarma Puja is celebrated with great enthusiasm, as it is mostly celebrated in workshops and offices so the entire premise is decorated and it takes an elegant festive look. The celebration is also followed by flying kites in the skies, whole sky becomes beautiful with full of colors of kites, and it also becomes a war zone for kites that flies higher in the sky. Also highly decorated pandals are also created for the puja, the puja pandals are installed within the premises. In urban areas loudspeakers are installed on many places on this day for enjoyment purpose. On this day family members of workers and owners all come together to make this puja a grand occasion, the rituals are followed by Prasad distributed among workers and owners. All the owners and workers together have their lunch on this day. The historical relevance related to Vishwakarma Day gains more weightage as not only is Lord Vishwakarma associated with creation but also with the manifestation of the sciences of industry to the humankind. It's because of this history that he is much revered by the devotees, more so by professionals like engineers, architects, artisans, craftsmen, weavers, mechanics, smiths, welders, industrial workers, and factory workers who make their living through their craftsmanship. And therefore on Vishvakarma Day, pandals are set up inside the premises of industries and factories and inside these pandals, images and idols of Lord Vishvakarma are established and from ancient times the tools, particular to each person's relative field, are worshipped in the name of Lord Vishvakarma and aren't used throughout the day. It's their day off! Then after the Puja is performed and the ritual is complete, Prasad (offerings) are distributed among everybody. Vishvakarma is personification of creation and the abstract form of the creator God according to the ‘Rigveda’. He is the presiding deity of all Vishvakarma (caste), engineers, priests, artisans and architects. He is believed to be the "Principal Architect of the Universe ", and the root concept of the later Upanishadic figures of Brahman and Purusha. Vishvakarma pooja has evolved deep roots with the vedic perios as In the last phase of vedic period and during the growth of monotheism, this realistic God concept becoming more abstract and one can see Vishwakarma (the invisible creative power) emerged as the supreme god. Who was perceived as a hotar, the unborn creator and name giver of all other gods who have lot of faces, eyes and feet on every side and who helps Tvastsar known as visible creative power of Lord Vishvakarma in producing all the Heavenly, Earthly and other Celestial realms and preserves them through the exercise of his arms and wings! He sacrificed himself to for the evolution of this visible world (Sarvamedha), thus he is regarded as Purusha or Narayana. Vishvakarma pooja shows respect and a kind of bonding between humans and their tools that they used to earn for their living and it also teaches us that we should respect our tools because they are always with us in our day to day life, also Lord Vishvakarma is regarded as quality and perfection of work, one should always try to perform and do work as Vishvakarma used to do, hence he always acts as an inspiring model to all performers.